Here are three things we gleaned from Tennessee’s 78-65 victory over Iowa in overtime, allowing the 11th-seeded Volunteers (down 12 in the first half) to advance to the Round of 64 against No. 6 UMass (Midwest Region — Friday in Raleigh, N.C.). On a personal note, we’re also gratified that Iowa coach Fran McCaffery was able to spend time with his team (Wednesday) and more importantly his son, Patrick, who underwent surgery to remove a thyroid tumor earlier in the day. The optimist would point to the Volunteers taking the Hawkeyes’ best shots — early in the first half and midway through the second half — and still hanging on to briefly take the lead in regulation … before pulling away for good in the end. 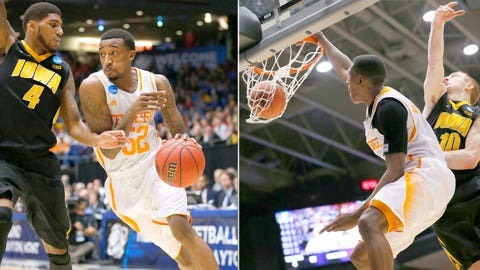 They’d also point to the incredible balance of UT’s starting five, with the quintet — featuring Jordan McRae (20 points), Jarnell Stokes, Josh Richardson (17) and Antonio Barton (10) and Jeronne Maymon (nine) — accounting for 74 of the team’s 78 points. They might even point to Tennessee holding a significant rebounding advantage for the night (37- 30), despite having less height, length and frontcourt manpower than Iowa. The pessimist, in turn, would cite the galling lack of bench production as a bad omen for Friday’s clash with a deep, athletic and sneaky-good UMass club. They might find fault with Tennessee’s poor transition defense, which allowed a few buckets off made baskets against Iowa, perhaps the result of each starter logging at least 32 minutes. They’ll also point to the Volunteers’ extreme woes when shooting beyond the arc: Of Tennessee’s last three games, the club has made only 9 of 43 shots … for a shockingly low 21 percent. Ultimately, though, everyone must view the Vols’ defensive effort in overtime as a major plus, holding the perhaps-out-of-gas Hawkeyes to just one point and zero field goals in the extra session. Yes, Stokes tallied 18 points (on 8 of 11 shooting) and 13 rebounds, but he also struggled mightily against Iowa’s Adam Woodbury, allowing the Hawkeyes sophomore to net a career-high 16 points (also on 8 of 11 shooting). Each Woodbury basket came from short-to-medium range, the happy result of having better position on just about every shot attempt. It helps to be 7-foot-1, for sure, or roughly five inches taller than the brawnier Stokes, but Woodbury shouldn’t have gotten so many clean looks at the basket — especially with Iowa star Roy Devyn Marble (seven points) connecting on only 3 of 15 shots. Fast forward to Friday, as Stokes will most likely be paired against 6-foot-10 power forward Cady Lalanne, a viable double-double threat for UMass, who scored in double figures for 15 of his first 18 games this season. Conversely, Lalanne hasn’t reached double figures in six of his last seven outings — a similar slump shared by Woodbury … prior to his breakout in Dayton. The Minutemen coaches and administrators deserve props for going heavy on power-conference schools throughout November and December, setting the team up for an enriching campaign in Atlantic 10 play — where all six NCAA tourney-bound clubs earned 10-plus league wins. In a seven-week span before New Year’s Eve, UMass (24-8, 10-6) beat Boston College, LSU, Nebraska, New Mexico, BYU, Clemson and Providence (overtime) and lost only to Florida State; and with the seven wins from above, the Minutemen had an average victory margin of 9.1 points. Of equal importance, UMass demonstrated a knack for flourishing under any scoring conditions, routinely outlasting teams in the 80s or 90s … or successfully squeezing each possession in conservative outings of 50 or 60 points. Which brings us to Tennessee’s ongoing badge of courage — not allowing more than 74 points in any game this year. From a common-opponents standpoint, both Tennessee and UMass both handled LSU during the regular season, with the Vols routing the Tigers by 18 (68-50) and the Minutemen squeaking by in a 92-90 thriller (Nov. 12 in Amherst, Mass. ).